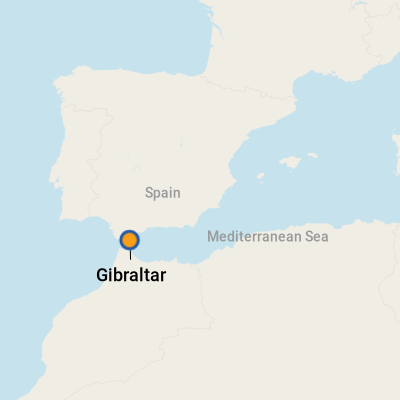 Gibraltar may well be a British Crown Colony but geographically it's an isthmus of Spain (you can walk across the road, though you do have to pass by some pretty tough customs guards). This proximity over the years has caused no end of irritation on the part of the Spanish government. In fact, during his reign, Ferdinand Franco (who served as dictatorial prime minister until the 1970s) was so upset by England's refusal to cede the territory to Spain that he closed the border and cut off telephone communications. Did you know the Rock, that famous promontory in the Bay of Gibraltar, actually faces Spain and not the Strait of Gibraltar leading into the Mediterranean? Once any cloud cover clears, and the entire enormity of it is revealed, though, it's an amazing sight visible from the cruise ship docks. There is an ongoing, off-and-on quarrel between Britain and Spain about who owns Gibraltar. The Spanish believe that because it's attached to Spain, it should belong to Spain. But the locals have voted twice to stay with Britain. As far as they are concerned, they are British and do not want Spanish citizenship. The 1,400-foot-high "rock" is a limestone formation, riddled with as many as 140 caves. Remains of pre-Neanderthal humans have been found inside the rock and in areas surrounding it, but the territory's more recent history is both turbulent and inspiring. Over time, populated by Phoenicians, Greeks, Carthaginians, Romans, Muslims, Moors, Spanish, Dutch and finally the British, the town of Gibraltar was formed in the 11th century by North African Islamics. The city is said to be "British Colonial built on Spanish Colonial built on Moorish." And that is exactly what the charming city resembles, with all of the influences present in its architecture. Owing its current status to Lord Nelson (who protected it during the Great Siege in the late 1700s), there are several monuments honoring the admiral, and museum exhibits explain the most recent history of the region. The strategic location of the territory has caused it to be used over the centuries as a fortified battlement, and in fact, the Rock itself has over 30 miles of roads within it. Traveling to the top of the Rock is almost mandatory and is easily accomplished via land tours or a quick cable car trip. At the top is a splendid nature reserve, and along the way, you can visit with the Barbary macaques (usually referred to as Barbary apes even though they are monkeys), the only free-living primates in Europe, and the Barbary partridges. Both creatures are unique to Gibraltar. Beyond the Rock and the handful of museums, the old town of Gibraltar consists of a main street jammed with tiny shops and a handful of famous British chains, such as Marks & Spencer, BHS and Dorothy Perkins. For North Americans, however, there are few bargains because prices are in the Gibraltar pound, which is equivalent to the British pound sterling. As for the future of the territory, it is claimed that as long as the Barbary apes inhabit Gibraltar, it will remain a British colony. You can bet that the apes are prized and pampered and coddled, and have no plans to leave the Rock anytime soon. Ships dock at Gibraltar Cruise Terminal just a mile from the center of town. The cruise ship terminal is small but offers international telephones, a snack outlet and a couple of touristy trinket kiosks for souvenirs. There are counters for taxis and tourist information. The crime rate in Gibraltar is low, but like everywhere else, it makes sense to look after your belongings when out and about. When close to the apes, do not touch or feed them -- after all they are wild animals. They are looked after by the government, and veterinarian care is provided by the Gibraltar Veterinary Clinic. The apes are fed a daily supply of fresh water and vegetables, fruit and seeds as supplement to natural food resources -- leaves, olives, roots, seeds and flowers. On Foot: Gibraltar covers about 4 square miles, so you theoretically could do everything on foot, but it's impractical because of the vertical geography of the Rock. The town center is just a mile from the dock and is a relatively easy stroll. By Bus: Public buses are an easy way to get around this small region. There are five bus routes in Gibraltar (numbered 1 to 5), and buses run to most areas of the territory apart from the Upper Rock. Take Route 2 from Line Wall Road south of Casemates Square if you want to head out to Europa Point, the bottom tip of Gibraltar. You can buy single tickets or day passes for a few pounds or euros. By Taxi: In town, taxis are readily available but fairly pricy relative to the short distances traveled. If you want to share a mini-bus up to the top of the Rock, you're looking at a cost of about ?15, and you'll have to pay the Nature Reserve entry price on top of that. Currency is the British pound, though banks issue their own notes and coins. British pounds are accepted everywhere, and euros are accepted almost everywhere. For updated currency conversion rates, visit www.oanda.com or www.xe.com. Ask for change in British pounds because it is hard to exchange Gibraltar currency outside the territory. ATMs dispense either British pounds or Gibraltar pounds. A Gibraltar 5 pence coin makes an unusual souvenir because it has a monkey on it. Shuttles at the cruise dock accept U.S. dollars. Gibraltar is a VAT-free jurisdiction. English is the official language in Gibraltar, but most locals also speak Spanish. Other languages are Berber, Arabic and Hindi because of the varied ethnic groups who live here. Hebrew is spoken by the Jewish community, and Maltese is spoken by some families. Locals sometimes speak Llanito, unique to Gibraltar and based on Andalusian Spanish. Most of the lunch spots in the tourist areas of Gibraltar serve British "pub-style" food, but try to find one that serves Gibraltar's specialty dishes; calentita, a delicacy made from chickpea flour; pinchitos, which are meat kebabs cooked over hot coals; and torta de acelgas, a spinach tart. Also consider a walk around the seafront or marina to explore many little bars and pubs that have "proper tapas," the Spanish influence is quite evident and appropriate for this location. Gibraltar's most famous cocktail is the John Collins. Ingredients are two shots of gin, a dash of angostura bitters, a dash of bitter lemon and lime juice, topped up with soda. Gibraltar Crystal is available in many of the shops in town. Items are produced in Gibraltar and entirely handmade; you can watch them being formed and even design your own pieces, from wineglasses to large vases. The glass factory is located in an old army barracks in the town square. Linens are also popular souvenirs. A wide array of stuffed monkeys are also available on the Rock, meant to capitalize on the Barbary apes that call the region home. Never mind that the apes have no tails and most of the stuffed animals do -- they're fun and range from teeny squeakers to great big, fat and fluffy stuffed companions.